Hyundai Creta in 2019 starts at the price of Rs. 43.56 Lakhs in Nepal. Similarly, its diesel version of Creta starts at the price of Rs. 50.56 Lakhs. Laxmi Intercontinental, sole authorized dealer of Hyundai cars in Nepal, sells and distributes variants of Creta. Currently, Laxmi Intercontinental is selling 7 different variants of Hyundai Creta including 5 variants of petrol and 2 variants of diesel. Petrol variants of Hyundai Creta includes “E Loaded”, “E+ Loaded”,” SX”, “SX AT” and “SX (O)”. These petrol variants comes with 1591cc engine. Diesel variants of Hyundai Creta includes “S” and “SX”. These diesel variants comes with 1396cc and 1582cc engines respectively. Please note that above price of Hyundai Creta is subjected to change and is for reference purpose only. Kindly contact Hyundai Nepal to get the latest showroom price. 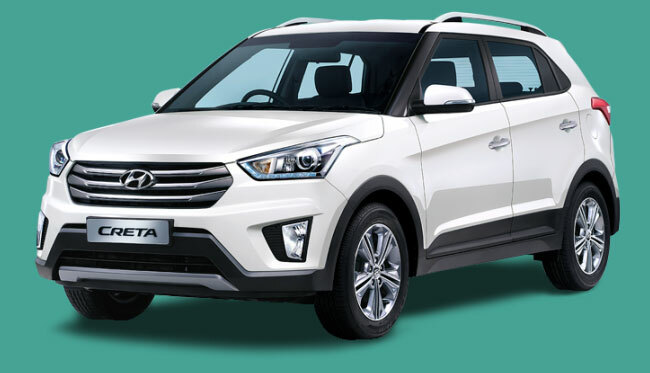 Note: Hyundai Creta price list was last updated on February 12, 2019. Creta is a subcompact crossover SUV manufactured by Korean company i.e. Hyundai. However, vehicles coming in Nepal are manufactured in India. Hyundai Creta is based on its fluidic sculpture design philosophy. It is undoubtedly one of the most popular SUV in Nepal since its launch. It has six airbag system along with vehicle stability management (VSM), Assist Control (HAC), Rear Parking Assist System, Electronic Stability Control (ESC), and ABS. The ground clearance of this vehicle is 190mm which is relatively low compared to other vehicles in same segment. You have option to choose between both Manual and Automatic transmission. You can message us your queries regarding Hyundai Creta price in Nepal or its specifications, features at our Facebook page.